Squeezer Thompson got into trouble early in this August 1988 contest for Spokane. He ultimately settled himself down enough to pitch six full innings and get praise from the opposing pitching coach, according to The Spokane Spokesman-Review. "He's probably got one of the best arms in the league," Southern Oregon pitching coach Jesus Hernaiz told The Spokesman-Review. Thompson's arm helped get him selected by the Padres in the fourth round of that year's draft. Thompson's arm, though, soon failed him, helping cut his career short at three seasons. Discipline problems also plagued his brief career. Thompson's career began that June as the Padres took Thompson out of Mount Dora High School in Florida. His discipline problems began in high school, Thompson drawing a suspension his senior year, according to The Orlando Sentinel. That, coupled with eligibility issues from changing schools had some questioning whether he should play. The Sentinel wrote. With the Padres, Thompson started at short-season Spokane. He also explained to The Spokesman-Review the origins of his nickname. It came from his pet back in Florida, a boa constrictor named Julius Squeezer. The name transfered to him. His formal name is William Thompson. On the field, Thompson got into 14 games, starting 11. Two of those outings came in the rookie Arizona League. His total ERA came in at 6.70. In early July, he had two-straight starts where he didn't make the third inning. 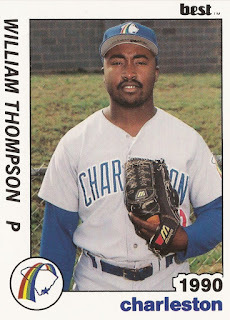 Thompson's 1989 season was abbreviated by arm problems and discipline problems, according to The Sentinel. It started with a lengthy suspension for literally fighting with his manager, The Sentinel wrote. Then there was an injury to his arm that required surgery. After all that, Thompson got into just a single game of action in the Arizona League. He then returned to the field in 1990 with single-A Charleston. He got into 11 games, five starts. His ERA came in at 17. He was released by the end of July. That October, Thompson told The Sentinel he believed his poor numbers were the result of not getting the proper rehab. He'd also just signed a new contract with the White Sox. The contract, though, did not turn into time on the field and his career was over.